I am so excited to introduce this new service to my wedding clients. Its a Portrait Style Photo Booth which I have dubbed… THE PHUNKY BOOTH! For some FAQs about this new service read below! What IS the Phunky Booth exactly? 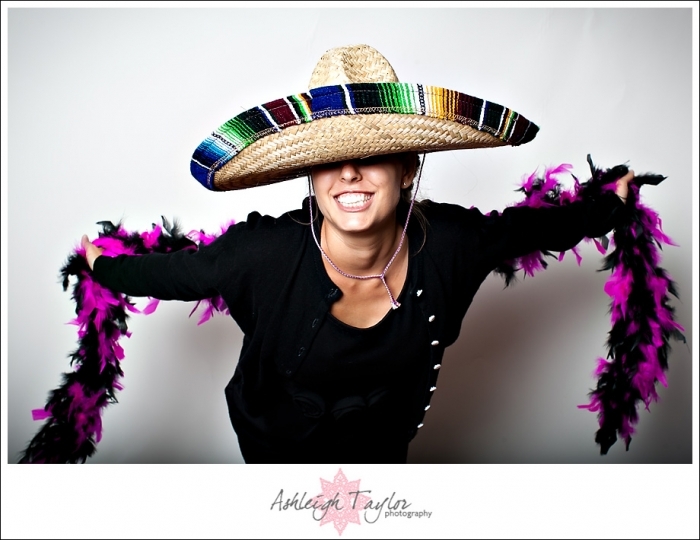 The Phunky Booth is a fun and “PHUNKY” alternative to a traditional photo booth that you might rent for your wedding. This booth is like a mini-studio set up at your wedding where guests can get CRAZY and take some hilarious professional pictures. This is not a “booth” that is closed off with a curtain. Me (your photographer, or at times my assistant) operate the Phunky Booth, it is not operated by a machine or your guests. 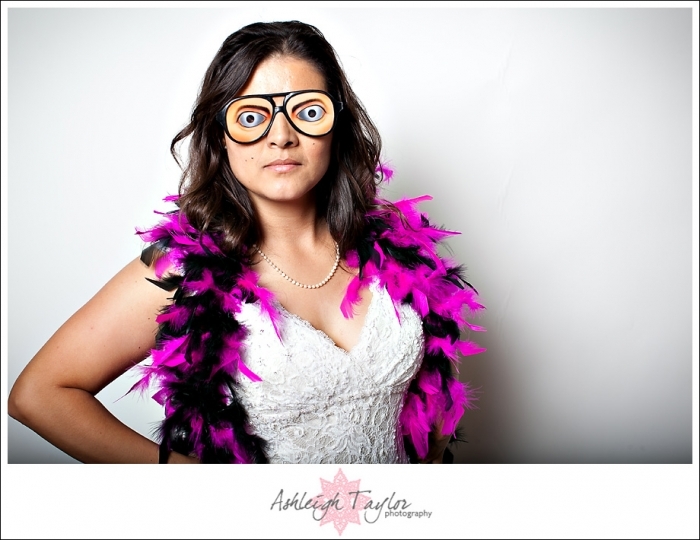 Why it’s BETTER than a traditional photo booth that you might rent? The Phunky Booth is truly an interactive experience. As the photographer I help your guests get PHUNKY and come up with creative and funny ideas to do in front of the camera. I also compose the photos to make sure the craziness fits in the frame in the best possible way! These photos are professionally lit and in front of a clean white background so everyone looks pretty darn good. We are shooting with a pro camera so the quality is AMAZING. The images from this booth look beautiful in your wedding album, a companion album or even thank you cards! This booth is something different, something new and fun for guests! 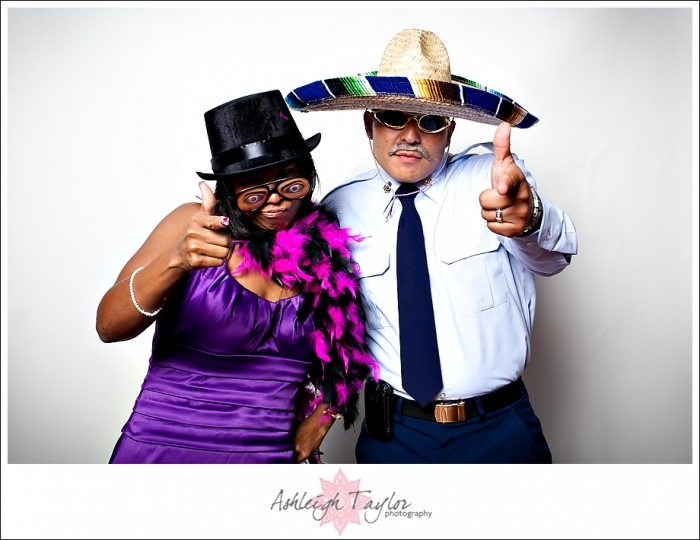 In fact, guests and couples usually enjoy and appreciate the photos of guests from a Phunky Booth more-so than traditional group shots and candids. So if shots of all your guests and loved ones having fun at your wedding is important to you, a Phunky Booth is the best way to go! The photos yielded are PRICELESS and will have you giggling for years. Lastly, this booth is also CHEAPER than most photo booths you would rent, so you save a little on your budget and get all your photos (wedding + phunky booth) in a one stop shop with ATP. Who can order a phunky booth? ANY of our brides and grooms from now (August 2011) forward can add a phunky booth on to their wedding day coverage. Sorry, this is only a service for our wedding clients. We are not offering at weddings that aren’t photographed by us. Is this an additional cost to my wedding package? Yes, this is a a la carte service which you can add to ANY wedding package or plain old coverage. It does work best with at least 8 hours coverage though. You can add the service on up to 2 weeks before the big day so you don’t need to decide right away. Although I LOVE doing Phunky Booths for my clients, they do require a lot of extra work, both on the day of and in post production, so this is not something I can offer for free. Does Phunky Booth have on-site prints? No, Phunky Booth is not a booth that spits out prints on site. So how do I get my Phunky Booth images? Your high-res Phunky Booth images will be on your wedding DVD. You will have printing rights to them, just like with your wedding images. You will also get an online proofing gallery for your Phunky Booth pics so guests can view them and order prints if they choose. You will also get a online slideshow of your Phunky Booth pics which is great for sharing on facebook, twitter, email, etc. The slideshow will also be showcased on your wedding website! -Add extra spreads to your wedding album. This is cool because we can lay out lots of images in a grid on a spread and you can relive the most hilarious Phunky Booth photos every time you pick up your wedding album! -Order a 6×6 or 8×8 Phunky Booth album as a companion to your main album! Nothing funnier or cuter than a whole lovely album of PHUNKY photos! …but how will my guests be able to see the Phunky Booth photos? We make little print out cards to hand to your guests with links for how to view the photos. In addition be sure to share the links to your slideshow, or better yet, your wedding website that I designed for you. If you share these links online (particularly via email or facebook/twitter) they will be sure to find the photos online! If you are shooting my wedding when do you have time to operate Phunky Booth? Good question! We set up your Phunky Booth either just before the ceremony or during cocktail hour. We open the booth during the reception (sometimes even part of cocktail hour if the timeline permits), but only during “down time” or open dancing. We do not leave it open during main events like “the grand entrance” “first dance” “cake cutting”, etc because during those times we want your guests to have their attention focused on YOU. We also do not leave it open during dinner because people are eating and also this is usually when we refuel on our vendor meal break. But other than these few moments, the Phunky Booth is open. If we weren’t doing a Phunky Booth during these “down time” periods we JUST photograph candids and open dancing shots. But to be honest those are so easy, you really only need one photographer covering that. So for Phunky Booth weddings during down time one photographer captures candids and open dancing shots and the other operates the Phunky Booth, which actually works out perfectly. And you get more photos of your guests this way too!! How much space does Phunky Booth take up? Where will we put it? The phunky booth is a mini-studio set up, and therefore requires about a 12×12 space to set up. Preferably indoors, but if it is an outdoor wedding than by a wall is better. We work with you and often your wedding or venue coordinator BEFORE the big day to plan where we will set it up. I need about a 12×12 space. I like it to be out of the way enough to not mess up your pretty decor but I don’t want it to be so far out that guests can’t find it! What if we want a different background than just plain white… something that matches our decor? You are welcome to provide a custom background to match your decor if you want. Please check with me for dimensions. Besides hiring you to set up Phunky Booth is there anything I need to do to make it a success? Like, should I supply props? I also ask that YOU (not the DJ) take the mic and announce to guests that the Phunky Booth is open for biznass and that you want ALL of them to “get down and dirty” or “bring the PHUNKY” when using it. This gives your guests the permission to be SILLY and let loose. They normally take the word of the wedding couple much more to heart than a generic DJ announcement. Lastly, don’t forget to USE the Phunky Booth on your big day! Pull your guests into it and take pics with them! Not only will you appreciate the memories you created with your loved ones, but you will also be encouraging more people to use it! Soooo…. that’s my introduction of the Phunky Booth!! Hope it was helpful and has you alllll excited! Of course leave comments with your thoughts or questions!